In this Friday story over at Reuters, they report upon the latest 'raising of the stakes' in Venezuela after President Trump national security advisor John Bolton warned Russia about their military presence in Venezuela, claiming any moves to establish or expand operations there would be considered by the US a 'direct threat' to international peace while warning that 'all options' would be made available for the US to respond if Russia didn't remove their troops from the nation. With large parts of Venezuela having once again 'returned to the dark ages' after electrical power went out again, the latest nationwide blackout that has made the Venezuelan people feel like they've 'returned to a time of life of centuries ago', we should pay close attention to what is happening there for several different reasons. As we hear right off the bat in the final video at the bottom of this story, with Venezuela's descent into anarchy almost complete, 'the gun' rules there now. With Nicolas Maduro and the Venezuelan government blaming the US for this latest blackout, claiming that our military had used unlawful electro-magnetic-pulse weapons to bring down their national grid and cast their nation into darkness, we've previously reported on ANP that Venezuela could be the fuse that lights World War 3 should Russian and US troops face off against each other. But with President Trump now finally past the Russian-collusion scam concocted by the left, we could also be witnessing more 'theater' as Trump's 'tough words' show the left he's no 'Russian pawn'. But with Zero Hedge reporting Friday night that the Pentagon had just put in a $250 million order of specialized gas masks, prompting their story to ask 'what do they know? 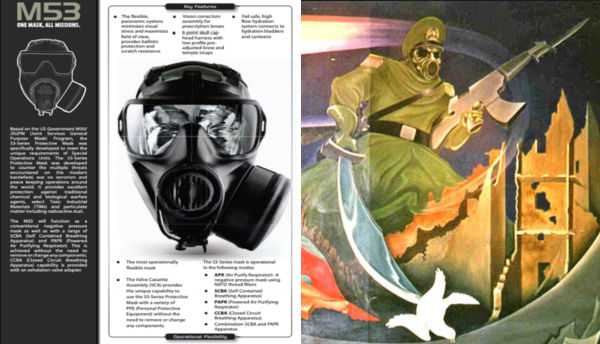 ', I couldn't help but immediately think of the gas mask worn by the rampaging murderous soldier on one of the Denver International Airport murals as seen in the side by side photographs below. With Russia wasting no time at all responding to Bolton's remarks as American writer robert Bridge reported in this March 28th RT story, reporting that the "US lecturing Russia to ‘keep out of Western Hemisphere’ is hubris & hypocrisy on steroids", has Bolton not read the latest news reports? As Dr. Peter Vincent Pry reported on ANP back on March 14th of 2018, 'mutually assured destruction is no longer mutual' thanks to Barack Obama's 'New START' treaty which allowed Russia to achieve the 'holy grail of nuclear superiority' over the United States, 'escalation dominance', via the development of Russia's unstoppable new hypersonic nuclear weapons. For those who think that Dr. Pry might be incorrect with his analysis, let's take a look at comments made by other experts on the topic of what World War 3 might look like in the present day and age we're now living within. Back on March 22nd of 2018, the website 'Task and Purpose' reported that while testifying before the Senate Armed Services Committee, US Air Force General John Hyten warned lawmakers "the U.S. isn't completely prepared to stave off adversaries' hypersonic missile technologies." Within that same story they reported that according to US Senator Jim Inhofe, a Republican from Oklahoma, America was powerless against Russia's new hypersonic weapons, a warning Inhofe repeated again back in November of 2018, that Russia was perhaps light years ahead of the US in their development of hypersonic nuclear weapons. And as we had reported on ANP back on March 13th while asking in a story if the Pentagon had recycled a program called 'Nitro Zeus' to take down Venezuela's power grid, a recent WW3 simulation done by globalist think-tank RAND determined that in a war between the US and Russia/China, America would be completely destroyed: "A gruesome annihilation" they warned. Yet for some reason, despite all of this proof that the US would likely be obliterated in World War 3, Bolton wants to continue to poke the 'Russian bear'. As mentioned above, while we could very well be witnessing a 'diversion' of some type in Venezuela, 'political theater' designed to achieve a certain purpose, we also should remember that neither President Trump nor Vladimir Putin are likely ready to completely sacrifice their country's in a nuclear war over Venezuela. 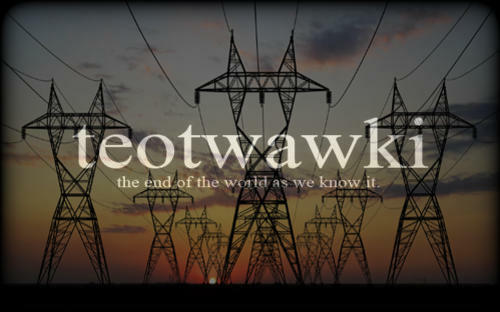 So while a nasty and potentially dangerous war may kick off over Venezuela that we should be keeping our eyes on, we can also learn a ton about preparing by paying attention to what is now happening in Venezuela with the national grid down there a real-life-warning of what will happen here should the electrical grid go down for an extended period of time. While we tip our hats to President Trump for his recent Executive Order on EMP and protecting our electrical grid, what's happening now to the people of Venezuela could very well happen here in the US should America get into war with Russia. And as we've long been warned, should the grid go down here for an extended period of time, our nation too will be cast back into the 'dark ages' with big American cities sure to turn into death traps as food and supplies run out. In stores, cash registers no longer work and electronic payment terminals are blanked out. That's serious in Venezuela, where even bread is bought by card because of lack of cash. Some clients, trusted ones, are able to leave written IOUs. And while America moves onward, as we had reported in this story on ANP back on February 23rd, with tensions flaring between the US and Russia over Venezuela, and with Russia's Mach 9 nuclear missiles sitting only 200 miles off of the East coast, 'doomsday' could arrive on America shores within 120 seconds of a Russian nuclear missile launch and such a catastrophe could only be one horrific escalating series of events away from occuring. 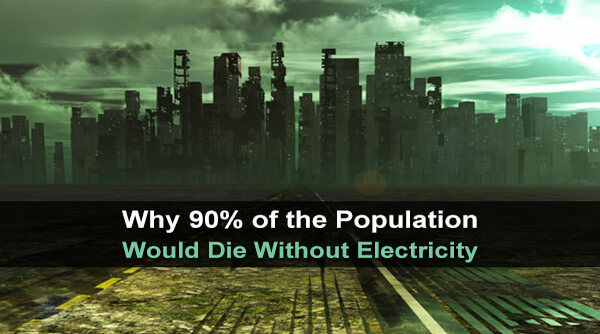 And with any World War 3 with Russia sure to include Russia launching EMP weapons that take down our nationwide grid, quite literally sending us back to the 'dark ages' along with Venezuela, we've long been warned that an extended grid down scenario in the United States could eventually lead to the deaths of 90% of the population or more, largely from starvation. So we pray that cooler heads prevail in the days ahead on Venezuela as while we absolutely feel and pray for the Venezuelan people who are living like slaves under the thumb of a dictator, leading to millions leaving the country and tens of thousands more suffering from starvation, a US invasion of Venezuela that pits America soldiers against the special forces from Russia who are already there immediately turns into a potential World War 3 scenario should worst case scenarios unfold there.